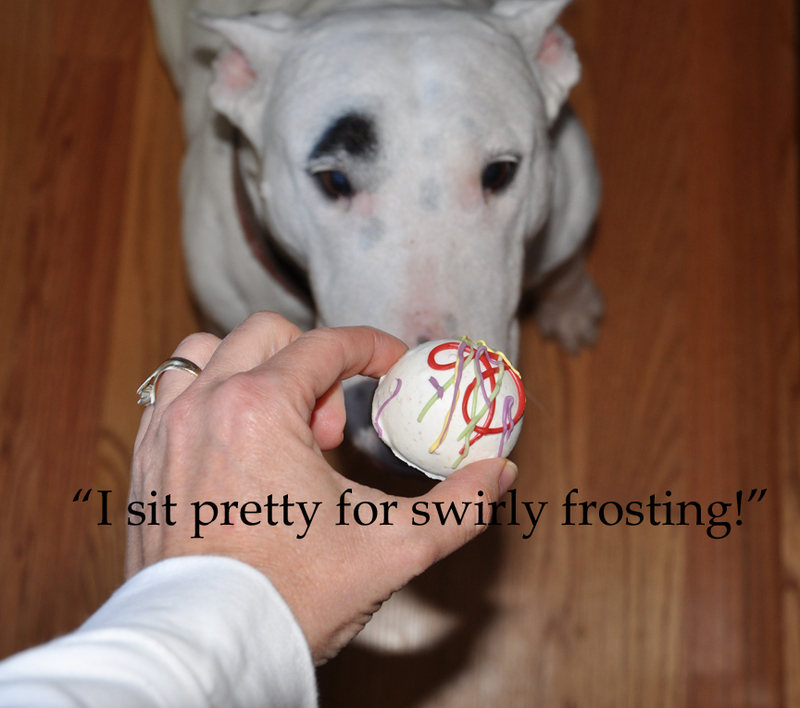 Cindy’s birthday/anniversary of being rescued from the puppy mill was this week. She got a new orange squishy ball (its minty flavored, or so the package said) and a new red ball that we can put treats in. 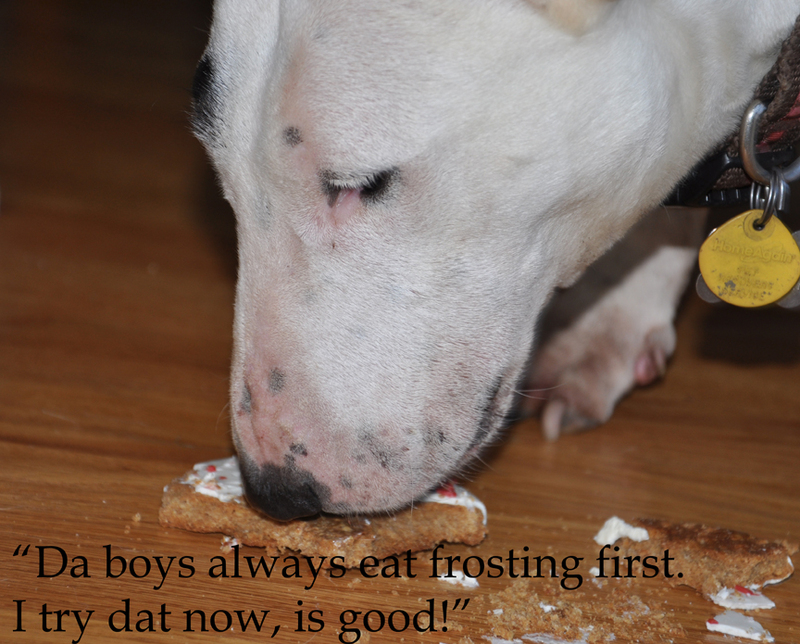 She’s already tested it with peanut butter and given it 2 paws up. 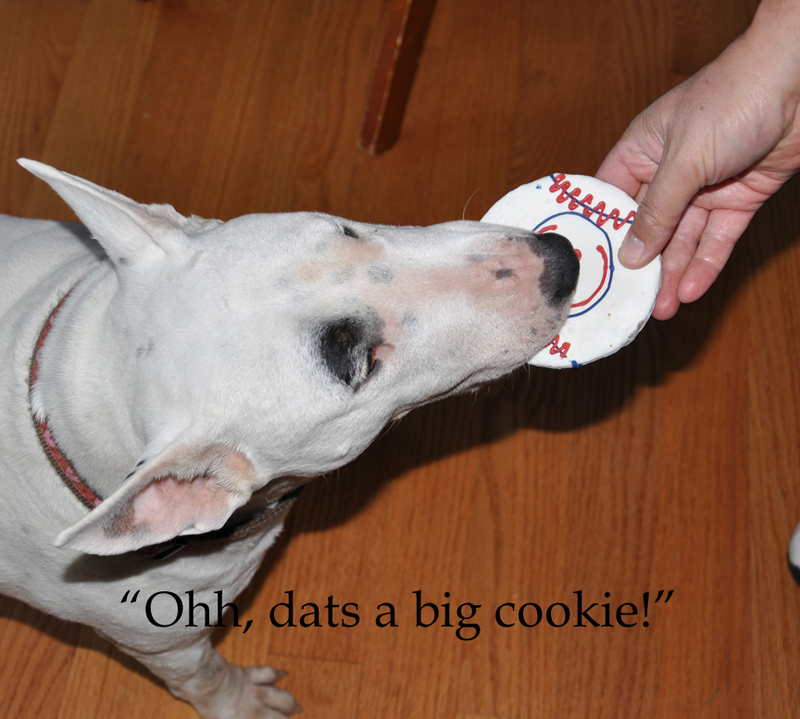 Instead of cake she received treats from the doggy bakery. I’ve been working on all kinds of projects, just can’t show you yet. Look out for some blog hops and other fun stuff in the near future! Fat and Happy, Very Very Happy! Posted on March 28, 2010 | Comments Off on Fat and Happy, Very Very Happy! I mentioned that Cindy was fat and happy, but I didn’t explain. Cindy’s daddy now comes home for lunch, and coffee, and snacks, and playtime. Cindy’s daddy’s commute has gone from 80 minutes (when the trains are on time) to 2 seconds! He’s been working from home, and no one could be happier than my silly girl. Sure, she loves her momma plenty. But when her daddy is home, every one else is chopped liver. No, wait, she would eat chopped liver. Make that cardboard, wait, she’ll eat that too. Uh, wait, no, there’s a lot of stuff she’ll chew on when she’s bored. Suffice to say, she’s not bored with her daddy home. She sleeps on the bed in the office, or on the bean bag under the desk (that just happens to be on top of a heat vent) and keeps her daddy’s feet warm. If she could only fit on his lap… She likes to taste test his lunch (and momma’s too), and make sure her daddy gets enough exercise by taking him out on walks and in the backyard to play. Now another update, if you’ve followed the story of little Evan. Molly and her husband have received the last of the paperwork and travel instructions, and they have booked their flights! They are leaving this week to complete Evan’s adoption in China! He’ll be home in about 3 weeks! More exciting news is that they’ve continued to receive financial support. Two very generous readers of MY BLOG contacted me to send them a donation. Thank you ladies! And then there is the gift of $3,500 gift from a foundation, which just about covered the $3,700 airfare for 2 round trips and 1 one-way! Join me in wishing them safe travels! I’ve got some art ready to post, I’ll do that in a minute. Comments Off on Fat and Happy, Very Very Happy! Buster had sisters, Peanut and Gracie, 2 small kittens. He never meant any harm to them, just wanted to sniff them. He liked Peanut, and he let her sleep with him and share his food. Peanut was a little slow, let’s just say the elevator didn’t go to the top floor, but we loved her. Gracie was definitely a cat, and she always a bit suspicious of Buster. Gracie certainly didn’t want that big ole snoot sniffing at her so she always kept her distance. Buster lived to be 9, and the cats lived to be 14 and 15. Correspondence with the local Bull Terrier Club informed us that no puppies were available, and none were expected soon. I checked the national breed site and looked up rescue dogs. There were a few on the site, at a location about 3 hours from us. We emailed back and forth about specific dogs available, and decided that on our vacation, we would drive down to “let a dog choose us”. The dogs had various stories, but most had been removed from abusive situations like puppy mills. Cindy was the first dog we met. She wagged her tail and responded positively to all of us, but wasn’t overly excited. She took advantage of the opportunity to run the yard and then we met a few other dogs ready for a home. Fancy was led in and rolled over immediately for a belly rub. The other dogs did not make an impression on us, or vice versa. For the rest of our vacation we discussed pros and cons of these 2 dogs. We decided we wanted both. No, we can’t have both, they said. A couple more days of discussion later, and we decided on Cindy, knowing that Fancy would find a home soon, with her happy little disposition. 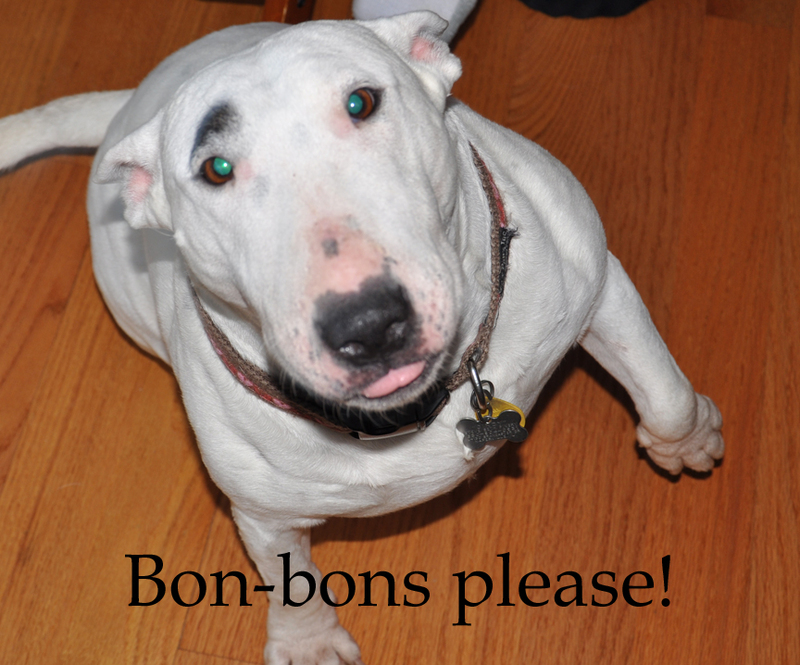 Cindy had been in rescue for 9 months, much longer than most other dogs. She liked us, and she needed a home. When we returned from our trip, DH hopped in the car and drove down to get her. When DH brought her home, he walked her around our yard, she immediately chewed the brand new leash I bought. He walked her to the back yard and she barked at the neighbor dogs, he led her to the back door, and she barked at her reflection in the glass. She barked at her reflection in the oven door, the dishwasher, and the fireplace glass. She barked at the ceiling fan. Her barking was of fear and self preservation. Cindy was a blank canvas, so to speak. She was an almost 3 year old full size, 43 pound dog that had never had a chance to be a puppy. She had never been inside a house, but was crate trained. We were never told how many puppies she had produced, but we knew that those puppies were taken from her shortly after birth to be nursed by another dog, so the birthing dogs could restart their cycles sooner, producing more puppies. We know the date of her rescue, because the next day is the first time she saw a vet. We know the USDA raided the puppy mill, brought in a truck, and filled that truck with as many dog cages they could fit on it, and distributed the dogs to their breed rescue homes. 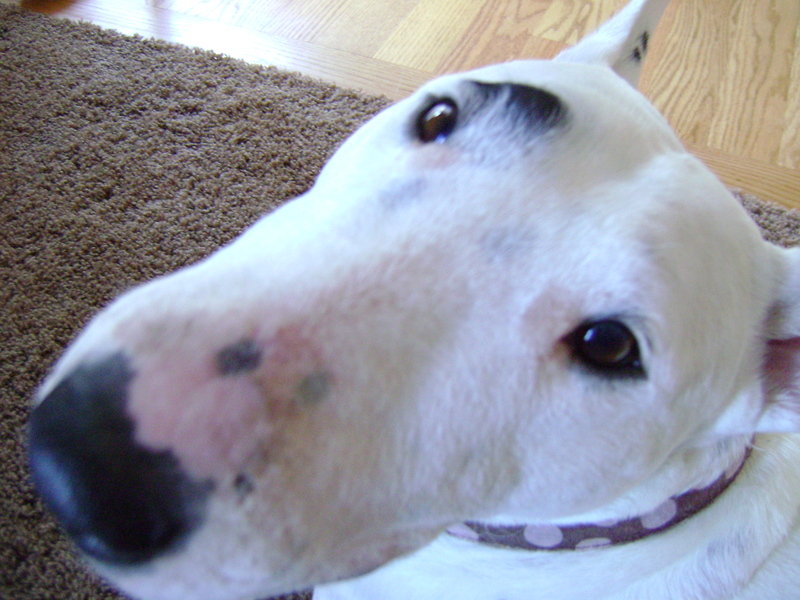 Of the 7 Bull Terriers at the puppy mill, one had to be put down and the rest were removed. The animals needed veterinary attention. Dogs should not be neglected and/or abused. Cindy has scars. One is on the top of her head, small but visible. One on her flank, about 1 inch long. She has scars on her legs, where the calluses were, from lying on concrete every day, all day. The calluses are now healed and hair has grown over parts of them. When we see a new vet at the clinic, they always ask about the scars. 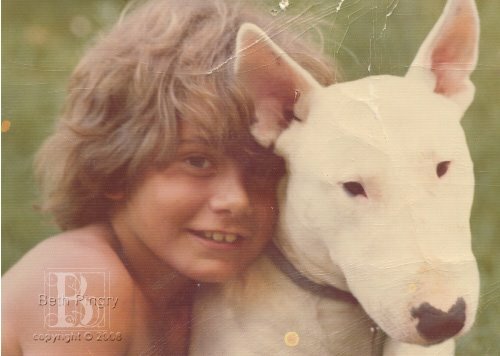 Once upon a time there was a family that adopted a Bull Terrier named Willie. They loved him and pampered him and he had a good life. Willie slept in the bed with the older brother, no matter how many times the younger brother switched beds just to snuggle up the big warm bed-hogging dog. Willie joined the family as an adult dog and he did what he pleased, much to the dismay of his people mommy. He lacked manners. He ran through the house, slept on the furniture, and enjoyed every bit of Bully mayhem he caused. Fast forward a few years, and the younger brother is a newly wed, with a new house and a nice yard. “We must have a fence around this yard”, he proclaimed. “We must have a dog to go inside of it!” he proclaimed. 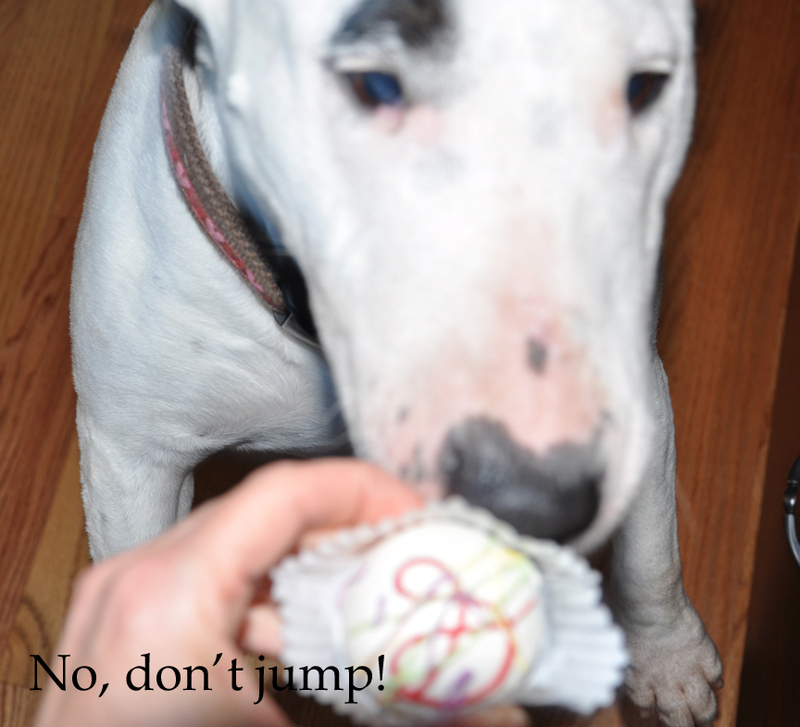 “Not just any dog, we must have a Bull Terrier!” he proclaimed. “OK”, said his bride, not truly knowing what she was getting herself into, having only heard legends of Willie’s antics. There was a puppy available, he was 17 weeks old and weighed 17 pounds. Half of that was in his head alone! After several days of observation and many names tossed about, they decided to call the puppy Buster. It was a fitting name. You may be thinking, I’ve seen that type of dog before. 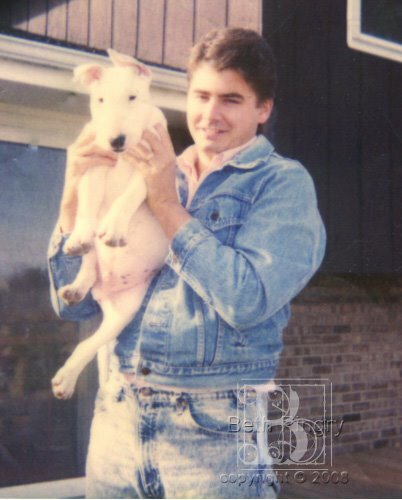 Yep, if you are 29 like me (and have been 29 a few times, like me) you will remember Spuds MacKenzie, the Budweiser Beer dog. Maybe you are thinking of Spot, the Target dog. 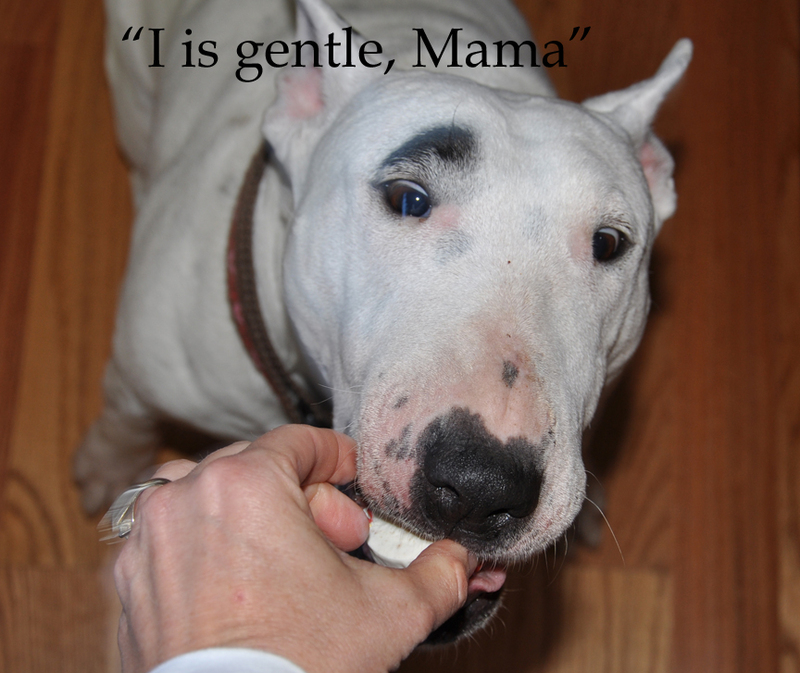 Yes, both are Bull Terriers. They look so sweet, don’t they? 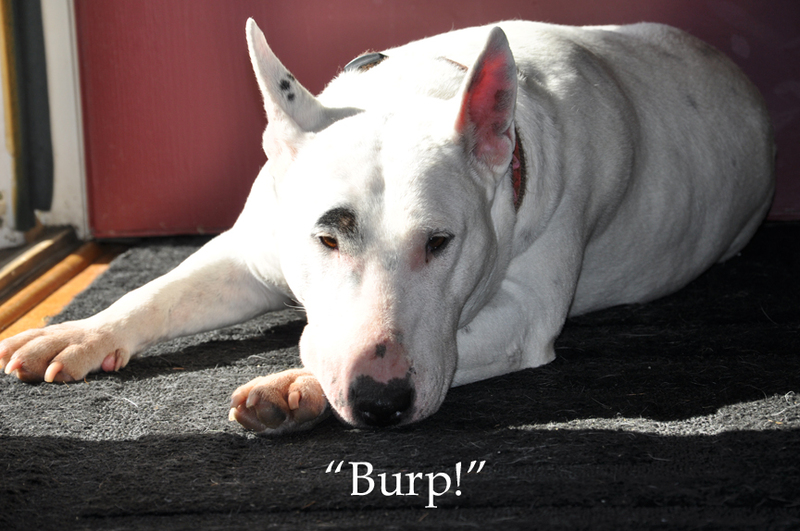 Bull Terriers are described accurately through the breed name. Bull, as in big hard head, body like a potato, and stronger than they think they are. Terrier, a perky, active, wiggly dog. Now put those together (think Tazmanian Devil) and let that run through your living room, circling the coffee table with your favorite shoe in their mouth.